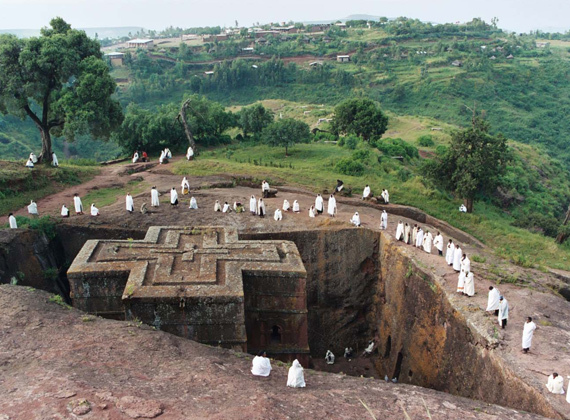 Lalibela, a medieval settlement in the Lasta area of Wallo, lies at the centre of an extensive complex of rock churches. Some can be reached by one or two hours’ drive, others are a full day’s journey. Lalibela has 11 remarkable rock-hewn monolithic churches, believed to have been built by King Lalibela in the late 12th or early 13th Century. These notable structures are carved, inside and out, into the solid rock, and are considered to be among the wonders of the world. Each building is architecturally unique but each reflects beautifully executed craftsmanship, and several are decorated with fascinating paintings. These astonishing edifices remain places of living worship to this day.